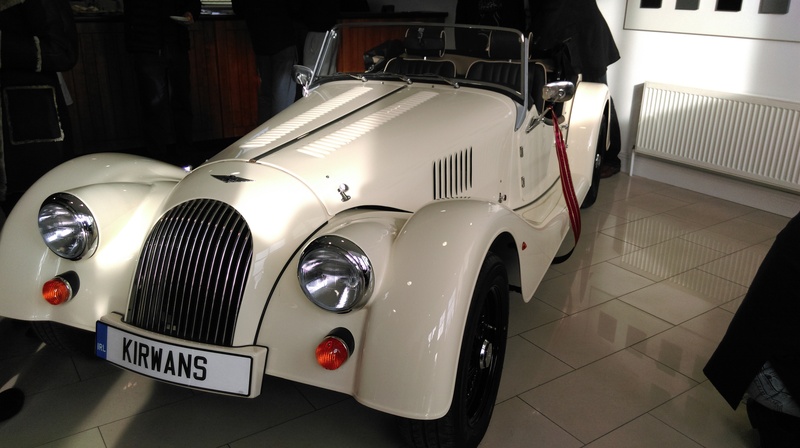 Kirwan’s Garage in Camolin, Co. Wexford, has been awarded a prestigious Morgan dealership. The new dealership, currently the only one of its kind in Ireland, was officially launched last month. The launch revealed a lively Morgan scene in Ireland, with many enthusiasts and collectors defying the January cold to drive to the event and display their cars outside. Also in attendance was Mark Ledington of Morgan Motor Company, who flew into Ireland to help officially launch the new dealership. Speaking at the event, he said how delighted the car manufacturer was to have a representation in Ireland at Kirwan’s, “for hopefully decades to come”. “We choose our dealers carefully and we do not appoint dealers for volume sales,” said Mark. The event was an opportunity to get up close to some beautiful samples of some of the range, including the Plus 4 and a modern take on the iconic 3 Wheeler. The Morgan Motor Company based in Malvern, UK, has been making bespoke sports cars for over a hundred years. Each car is handbuilt to the highest standards of craftsmanship, and just 1300 cars are built each year at the factory in Malvern. The company will tailor your car exactly to your specification with a range of options and upgrades available, from the paint colour and upholstery, to even the piping on the carpets. Kirwan’s will be selling the full portfolio of Morgan cars. The 3 Wheeler, will sell from roughly €42,000, the 4/4 from roughly €52,995 and a Plus 4 from around €60,000, all depending on the level of specification.